Price $7,995.00 each. Buy two for $ 5,995.00 each. 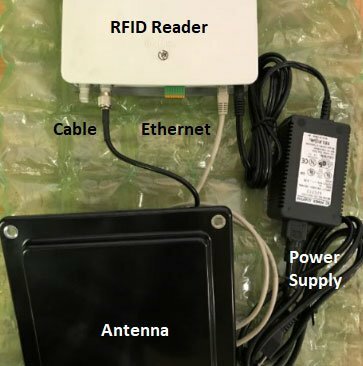 Mobile RFID Race Reader w/ Side Antennas. Orbiter is unlike many mat systems that charge extra for cables, antennas, power supply and rechargers. With Orbiter everything you need is included in an all in one form factor. 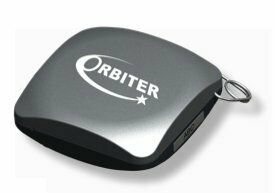 Orbiter includes RFID reader, antenna, cables, power supply, built in recharger with power indicator lights, 24 volt battery, and Wi-Fi. Just roll the SPIRE in place and turn on and the system. It will connect automatically wirelessly to the computer to run your race. Accurate timing detects racers at the finish line. No wasting time with dirty mats, running cables, or building overhead structures for antennas. All-in-one complete system just rolls into place and you’re good to go. For race timers buy two and gain the ultimate in tag detection positioning. No other side antenna is cable of tag positioning like Orbiter. This is because of our RIC (Remote Intelligent Communication) software loaded inside the RFID reader. RIC makes the traditional Plastic Pelican box detector obsolete and allows positioning of the RFID tag. This is why Orbiter is true “Space Age Timing”. The SPIRE is proven ideal for Bike Races having been used by elite events and Olympic time trials. Much better that mats systems, or expensive and time consuming to set up overhead structures. No worries about International Fire Marshall rules that prohibit low hanging arches. The Orbiter method with tag detection positioning provides better accuracy than any other. Way point detection readers along a course are far easier to set up with Orbiter than other systems too. Buy two SPIRES and mix locations. Put one SPIRE at the Start / Finish, and another SPIRE as a way point to prove a competitor made the entire course. For big races, by placing two at the start / finish such that the beams overlap, you gain 2 watts of radio power right over the line. This is twice the power of a mat system that is 1 watt. Orbiter has superior tag detections than mat systems. For School Lap Counting only one SPIRE is needed. 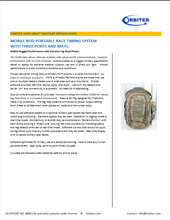 A Microwave RFID SPIRE is used from Motor Sports and the Military. No batteries to recharge as in many other active systems. No cables to lay down on a track is an important feature. Automatic detections with no manual interface to push a button to turn on. 3 minute easy setup. Set down, turn on and have your race. 8 hours rechargeable 24 volt DC battery life, Dual AC (120 v and 220 v) with built in recharger with indicator lights. Phased Detect Smart Antenna, controllable beam with first and last tag detect seen control. Most time accurate RFID on the market as measured by USAF. All weather rugged design works in rain and dirty environments: Guam torrential rain, Canadian mountains & Mojave desert. 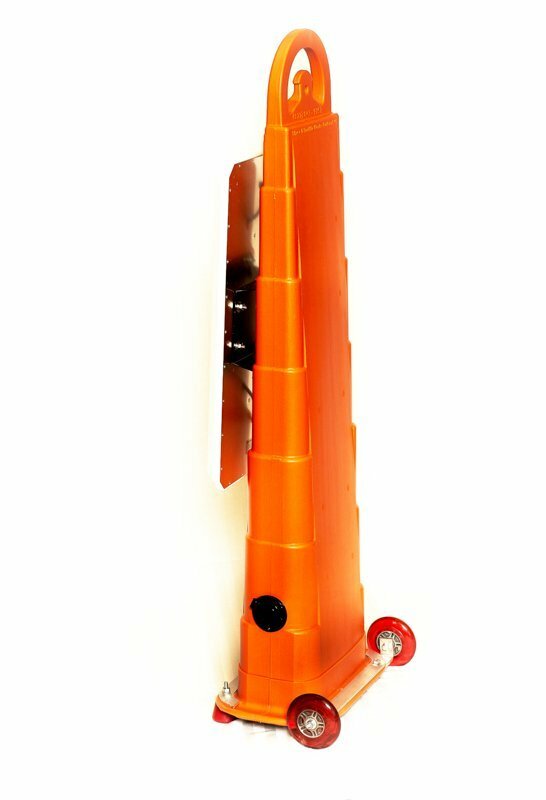 Rugged SPIRE reader is designed for all weather operation. The design is stable in windy conditions. This is due to weight of led acid 24 volt battery in the base. Wheels make it easy to roll around. New 1,200 tag detections per second. Autonomous smart operation. Wi-Fi, Ethernet, Data Cellular. Good for small (85 people) to large (30,000+ people events) events. AGM batteries Approved for airline transport. Light 29 lbs. weight including batteries. 47″ (H) x 17 ” (L) x 10″ (W). 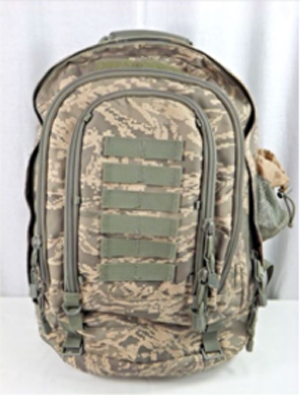 Rugged Back Pack with extended 40 ft RFID read range. May be set down on the ground for automated reads. No button pressing, insertion of proximity card or manual intervention. Thus many people may be read. The read distance is controllable. 8 Hours of battery life. Benefit is high flow past reader with up to 250 passing at one time. No bottle necks as with other Orienteering detectors. Also, the ability to track participants in real time using data cellular connection back to the Start Finish computer in real time. Be creative with Versatile set up allowing multiple PATHs for any order of detection to win. WI-FI and Manual download backup. Operates on 220 v or 120 v Ac / 24 volt DC. Ideal for Trail Running events, Obstacle Courses and Path Events. A Path Event is an event where many packs are set out and compass course or participant determined order of detection between packs is determined. Designed for desert, arctic, or tropical operation. Like the Spire, may be recharged during operation. Approved for Airline Travel, 250 Tags Per Second Read Rate, NEMA 4 Operation. Optional Iridium Satellite Connectivity for Real Time results any where in the world. 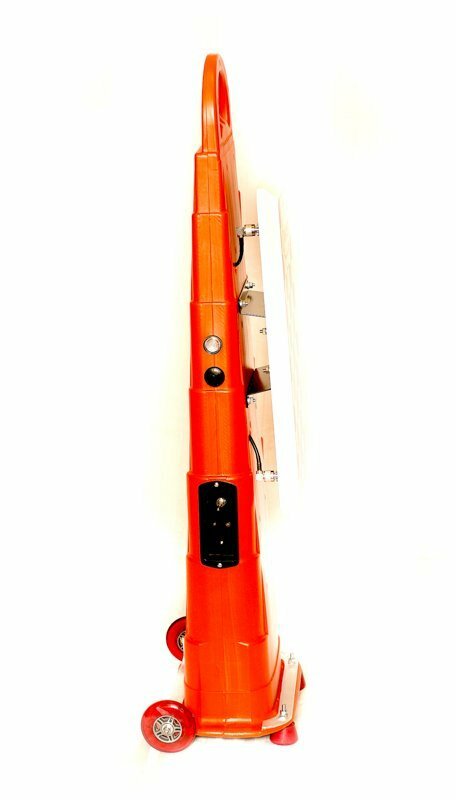 Price $4,995.00 LONG RANGE SLING / $ 3,500 SPARKY FOR SCHOOLS. 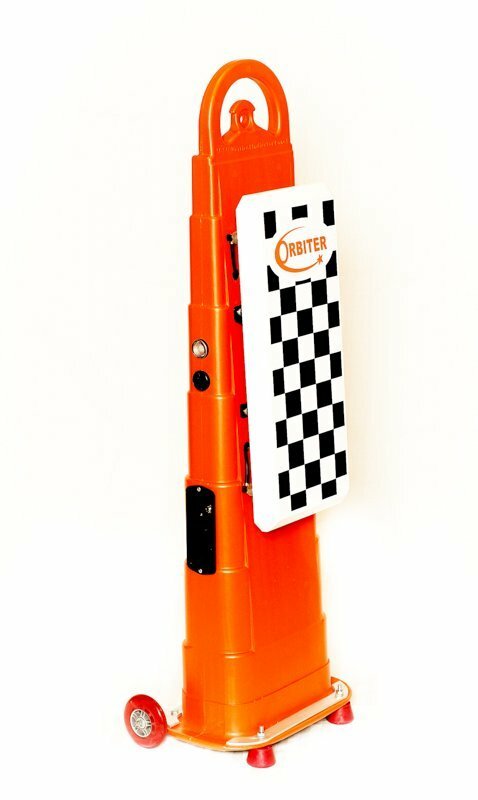 Mobile RFID Race Reader. Easy transport on Mountain Bike into remote areas. Automatic detections with no manual interaction such a pushing buttons or manual scanning. The Orbiter Sling reader moves where you do to pick up tag reads. Sturdy case with comfortable strap lets you move about with ease. 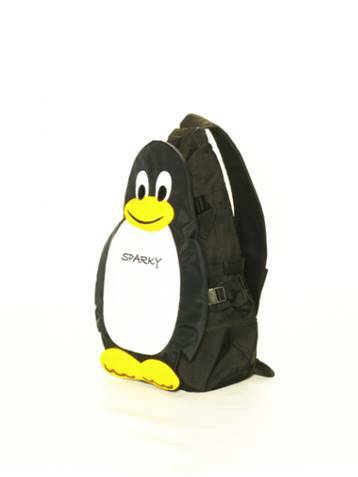 It comes with a rugged travel case for taking it on the road or for checking into baggage at the airport. 90% of all road races may be times with the SLING with greater time accuracy than mats. Mats cost 3 times as much and are difficult to set up. With Orbiter SLING just turn on and “go”. 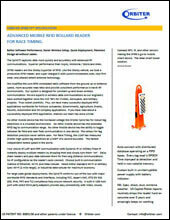 Lower cost to time a race and more time accurate. No need for a special truck as you auto or rental car works. Our batteries are safe and approved for airline travel. LONG RANGE SLING Read distance of 40 feet. SPARKY for Sschools 20 ft.
Rechargeable batter life 4 hours. Optional, 36 Hour battery pack. 250 tag reads per second. 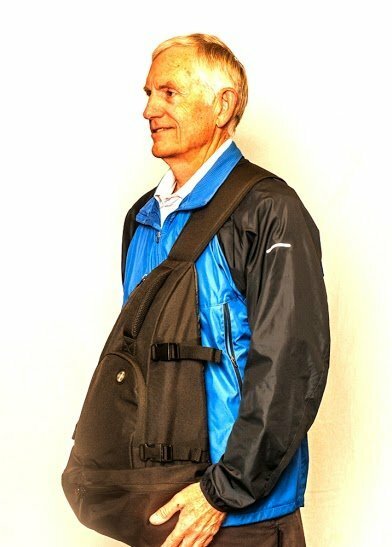 Ideal for triathlons and 5K races and with 1000 people or less. Far superior performance than handheld bar-code and RFID devices. Longer battery life, tag read zone lobe, reliability, lower total cost and ease of use. Includes school software. 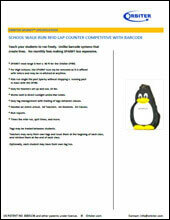 Ideal for school lap counting for physical education of small and medium sized schools. 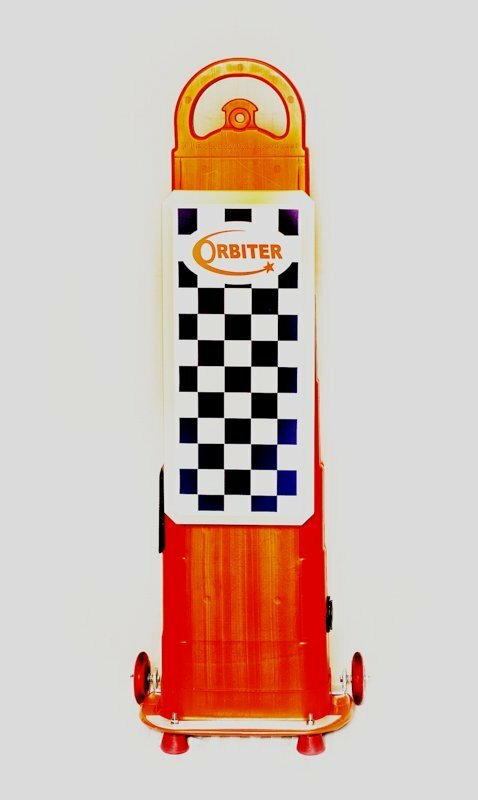 The Orbiter Sparky reader when placed on the ground and has 10 ft. of range. Automatic detections with no button pushing or manual scanning. Students “Run Free” with out hesitation or stopping. The only school lap counter we know that does split times for hundreds of students at a time. Rugged all weather design. The only lap counter that is appropriate for both physical education and PTO / PTA fundraisers. Greater range of up to 20 feet when placed on a box or chair. Weight 15 lbs. 4 hour battery life, or powered by AC. Optional extended life battery available. 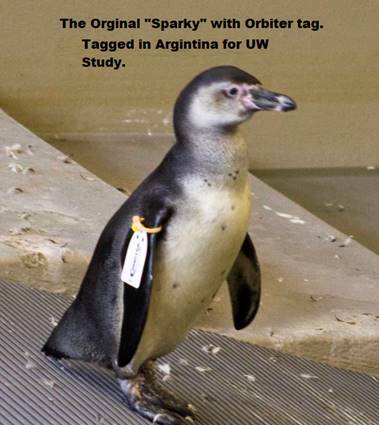 Robust 250 tag reads per second. Also, detects split times and can be used for mile run tests. Ethernet download of data, or optional Wi-Fi connectivity to laptop. Laptop not included. Requires Windows 10, Microsoft Student Office for Excel Reports, and an i5 laptop. Race Timing Rental New lower rental price of $395.00 per event. First 100 transponders free. The only rfid chip timing system that is successfully rented to first time users. So easy to use “Anyone Can Time a Race”. We built the rental specifically for you. No cables or mats to set up. Our product is even used at Olympic Training Centers. 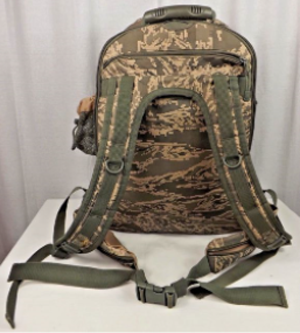 Complete system ships in convenient luggage case with everything you need including Sling Reader, laptop with pre-loaded software, RFID bibs with electronic file. Easy to use with instructions included. Free online instructions. Save hundreds of dollars on your next event. The rental system comes with all you need, including a pre-loaded laptop computer. You will receive the rental unit the Wednesday before the race. We recommend 40 minute of over the phone instruction 3 days prior to your event, with a 20 minute refresher day before the event. Orbiter technical assistance is always available by phone before during and after your event. Transponders on your bibs are $ 1.97, and with the purchase of full color customize bibs to your liking $ 2.49 each. Orbiter is able to rent you timing equipment because the set up is fast and simple to use. The equipment is light and compact eliminating the need for mats, overhead structures, and heavy time detector control box. To have a successful race all you need to do is (1) turn on the Orbiter, (2) Know who you gave the bibs to, and (3) get a beep at the finish from each participant. Administration of the timing software may be done before, during and after the race. 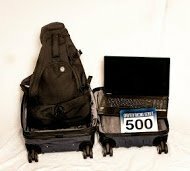 Down load of race data from the SLING to the laptop may happen in logging mode with or without a live connection. 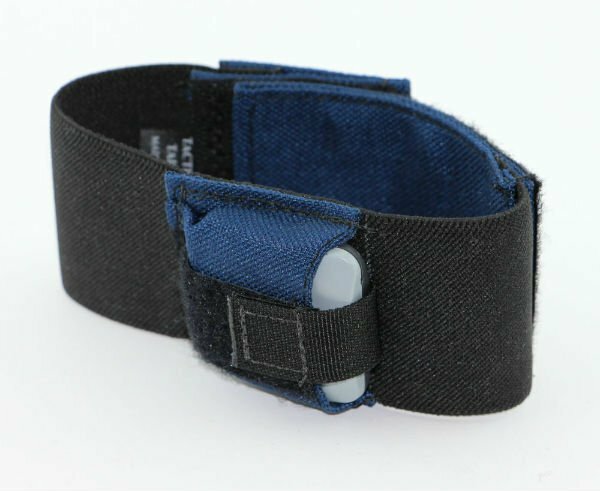 Electronic Wrist Band for School and Park Walking Programs. 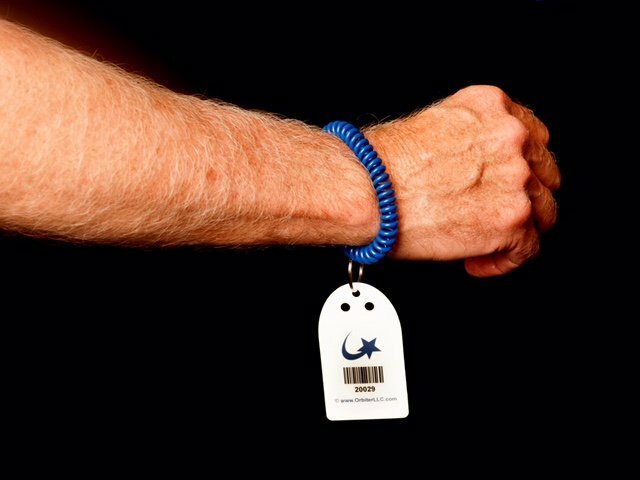 The tag is designed to be worn on wrists and is convenient to walkers and others that have difficulty bending down. It is also excellent for schools where the custom numbering identifies teachers and students by color and class number. The Orbiter system allows tags to be traded between classes and individual data retained for each class and student. In 5K’s walkers and others may prefer this tag since it dangles from the wrist as opposed to being tied to a shoe. The tag has no battery and able to derive many of the same statistic important to kinesiology. 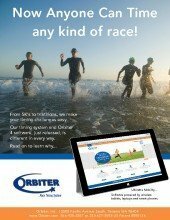 When compared to battery operated wrist bands and pedometers, Orbiter has the advantage of automatic download of data such that an entire school’s student data is done in seconds as the tags pass the Orbiter reader. This compares to only 7 at time for many battery operated wrist bands. Teachers have no time to replace batteries and they are costly. 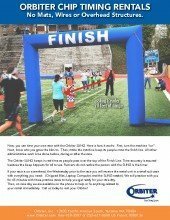 Orbiter solves these problems and why we are the number one choice of wearable wrist bands for schools and the military. 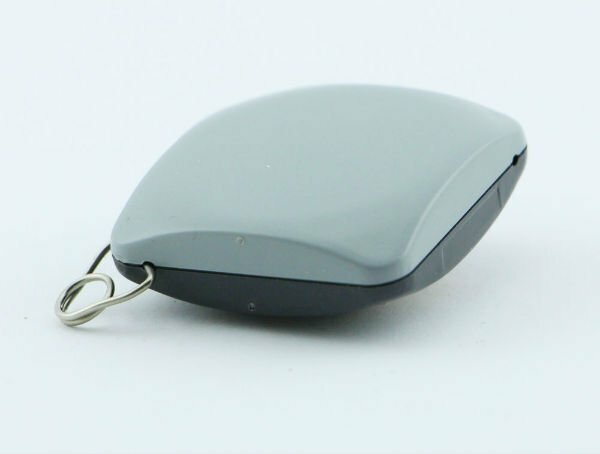 The tag is discounted and costs a fraction of battery powered devices, including Pedometers. $ .05 each low cost on roll of 5000. Transponder (chip inlay) and Bib may be purchased separately or together. 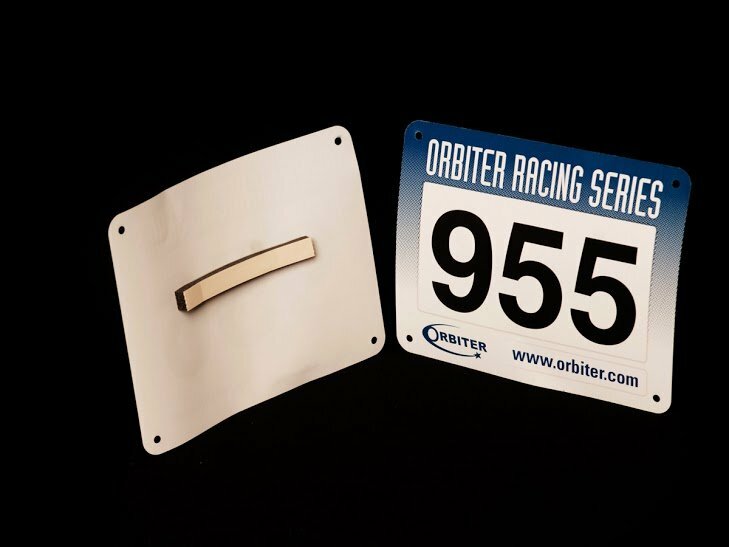 As a benefit to Orbiter CORT’s (Certified Orbiter Race Timers) to keep you competitive, Orbiter provides you the world low cost transponder price at $.05 each in a roll of 5,000. We found manual encoding of the RFID chip when placed on the bib and then encoded, is far superior than using an expensive German like machine encoding. With the Orbiter system human error of lacing the wrong chip on the wrong bib is eliminated. This is because you place a blank RFID inlay on the bib, and then set the encoder counter and start incrementing up. Check sum quality control assures your numbers are correct. Unlike German like machines that make you match the pre-encoded inlay with number to the bib. The German engineered method is expensive AND can cause errors. How expensive? Orbiter method after purchasing the inlay and your labor to affix the tag to the bib is just $ .18 cents per unit. The German machine of affixing the inlay to the bib method is $ 1.00 or more. The Orbiter manual method is easy even for races of 50,000 person races. Line up your volunteers and save up to $ 50,000 per event. Make sense? Sometimes machine automation works against you where good old human manual methods are best. No mechanic breakdowns with the Orbiter system. Only savings! Self application of transponders requires an enrollment machine with software for one time $ 1,950. The enrollment machine allows writing and rewriting on tags your unique ID, or increments automatically for bib numbers when passed through the enroller. This is unique in the timing industry because many timing equipment manufactures do not allow you to write your own tag id’s. Call for quote. Or, as an option the customer may purchase the transponder pre-applied onto bibs. Included is the electronic file that is used by the application software. Most customers purchase this option as there is no minimum purchase requirement. 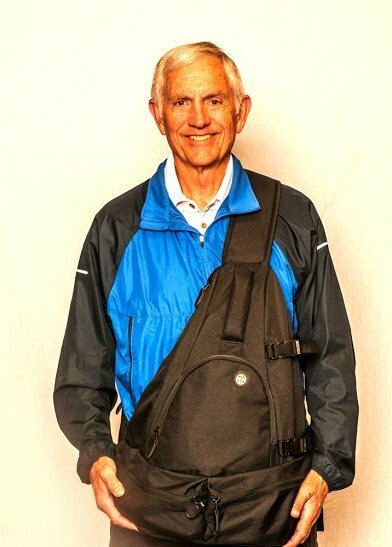 For full service, you may purchase custom colored and designed bibs with the transponder and everything included. Safety pins extra. The tags have special foam paired to works together with the radio signal from the reader. Orbiter tests each tag prior to sale, and have found that many GEN II Standard tags operate differently. For example, we have several suppliers tags consistently have 1/3 the read range. Also, a small percentage do not even have identifiers on the tags. This causes loss of race results. 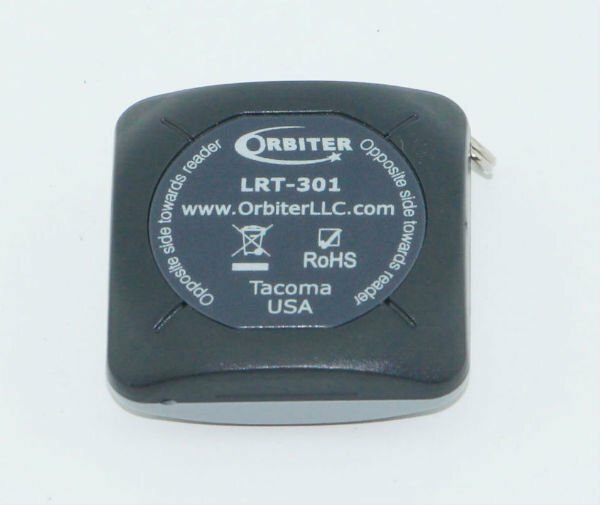 Using Orbiters pre-tested tags ensures excellent working RFID bibs. The Patented 3D (three dimensional) tag is unique and especially designed for Triathlons, mud runs and fitness assessment testing. 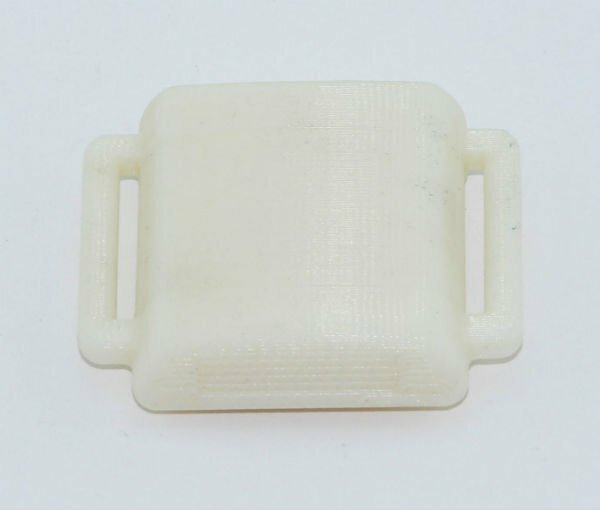 It is the only passive tag (no battery) worn by participants in the with a 3D antenna that is attenuated to the human body. (Attenuated means gains maximum radio frequency intensity.) It is rated the best passive tag by many Ironman timers. 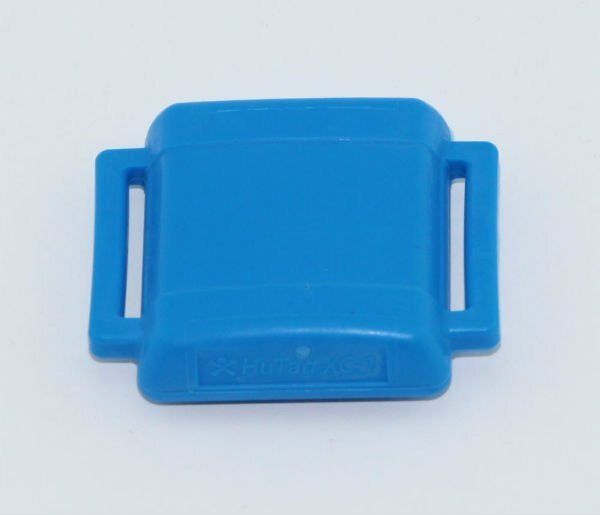 The benefit of the tag is increased range up to 27 – 29 feet, regardless of the vertical or horizontal position of the tag to the RFID reader. This allows for consistent read ranges regardless of the position of the tag to the reader, (as long as the tag is seen by the reader). Prior to Orbiters 3D tag, similar performance could only be obtained by “active tags” at nearly 5 times the cost. 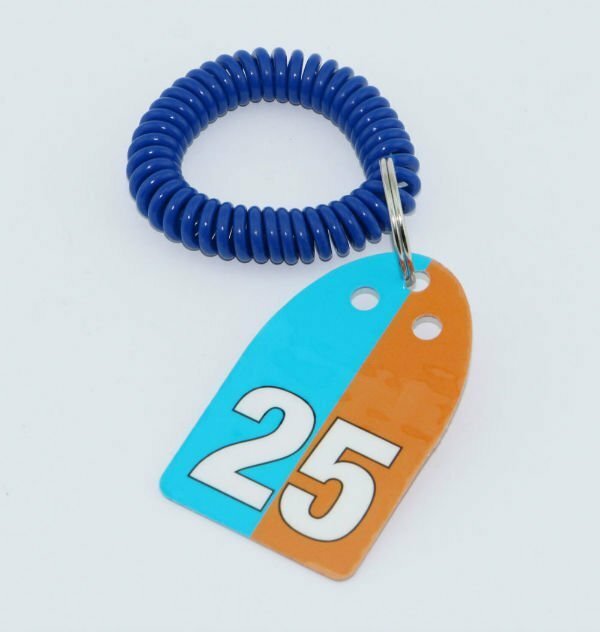 As background, pure passive tags are very low cost and are used for 5K’s, marathons and road races. Passive tags when positioned sideways to the reader the tag distance is reduced by the COS of the Angle. This means up to 1/3 the read range as when perpendicular to the reader. Pure passive tags work well when pinned to a bib because the position to the reader is aligned. 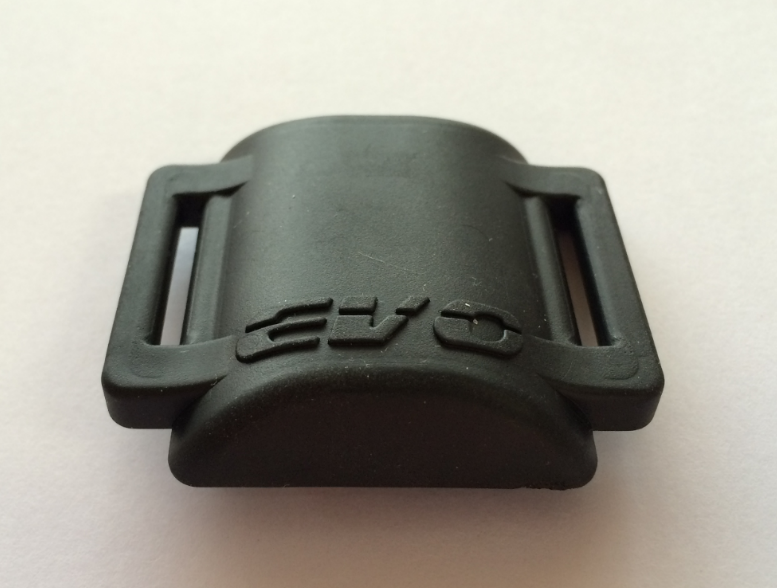 Some OEM (Original Equipment Manufactures) use standard passive tags for Triathlons. 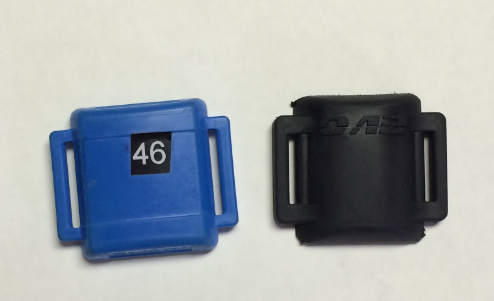 These are placed into ankle tags, and when this happens poor detections can occur. The 3D tag was built for racing from the integrated circuit used on up. 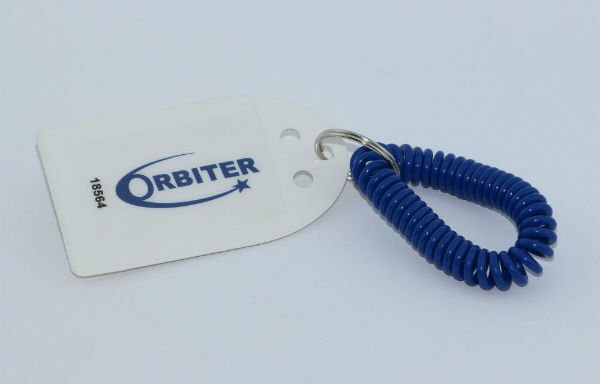 The Orbiter 3D tag works exceptionally well as it was developed for exclusive sale by Orbiter. Microwave RFID Timing Transponder. The small microwave tag has the greatest range, accuracy and fastest tag detections for quick data transfer. The battery lasts 5 years, regardless the number of events timed. The size is just 1 inch by 1 inch by 1/2 inch, and is used to track bullet trains in Europe and Japan. It also has the fastest read rate on the market with over 200 mph speeds and is excellent on metal and impervious to EMI (electronic magnetic interference). This is the tag of choice for the military and is used for military fitness assessment tests. The tag is another unique design by Orbiter because it is always “on” and does not need to wake up like other active tags. This means it is the most responsive (quick to time) active tag on the market. Rent a Race Timing Clock. Orbiter recommends having a two-sided LED clock with 4-inch letters. This product may be rented by race timers and race managers for additional income. The LED clock allows race participants and spectators can view finish times from either perspective. Two-sided clocks are commonly desired by photographers because a runner’s finish photo may be taken with their time shown. The GROOT SYSTEM is a powerful AC powered timer and lap counter. It weight just 6.4 lbs and reads 250 tags per second. The GROOT has Superior performance as it uses the same RFID readers as other Orbiter products. The GROOT uses 120 volt AC and give you excellent tag read rates the same as our other products. If you would like battery power at a robust 24 volts with robust tag read rates, please look to purchase the SLING or SPIRE readers. Many customer enjoy the economy of the GROOT.